Boats remain anchored in the deeper water at Clear Lake in Wasagaming in Riding Mountain National Park in Manitoba, Canada as people start to mingle on the beach during the summer months. Some of the activities around Clear Lake which people can enjoy are swimming, tanning, boating, skiing, wakeboarding, fishing, canoeing and kayaking. A campground is located near the shores of Clear Lake creating an easy access to the beach and the main core of the town of Wasagaming is within close proximity, offering visitors a chance to explore the unique shops, restaurants and art galleries. Clear Lake provides plenty of shade as tall trees border the sandy beach for those who do not enjoy the hot rays of the summer sun. 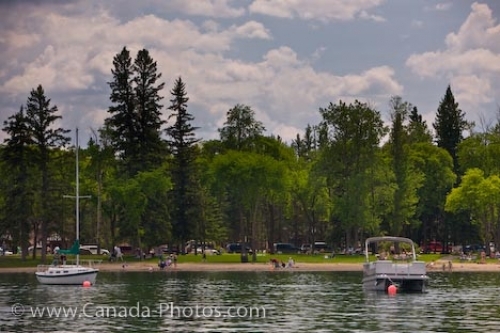 Clear Lake is the largest lake in Riding Mountain National Park and is a popular destination where people enjoy their summer vacations. Approximately 300,000 visitors come to Wasagaming on a yearly basis, a place where the activities never stop. Picture of people enjoying the summer activities along the shores of Clear Lake in Wasagaming in Riding Mountain National Park.